When my sibling and I were organizing my mother's 80th birthday party, I asked to create the invites. I was not a paper crafter but I was determined to do something special for my mother. I watched U-tube videos, took classes and connected with a wonderful creative group of women. I was thrilled with the invite results. What a fun journey this has been. I have never looked back. I hope that everyone takes small steps and moves forward on their creative journey. I am here to help you in any way on your journey. While on my creative journey, I tried many different products but was really excited about the Close To My Heart family of products. I love the quality of the products and how you can mix and match all the colors. 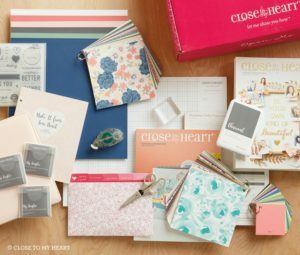 Close to My Heart products have made being creative fast, fun and easy. Everything we do has a heart of purpose and creativity for you to enjoy this life! Helping you create beautiful works of heArt and enjoy this journey together. Learn more about joining my team of creative designers for a fantastic personal discount and special designer benefits.